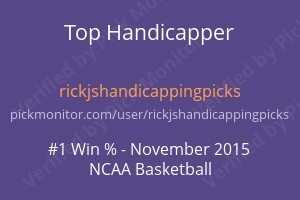 A busy day Tuesday with 5 one unit plays across College Hoops, NBA and NHL!!! You never know how a day is going to turn out for plays as there is so many moving parts they typically do not come together except in rare circumstances shortly before game time. Tuesday was no exception as only one play was sent out early. The other 4 were sent out about 10 to 20 min before game time. We had 5 plays and went 3-2 for the day. In College hoops we picked up a bit going 2-0 . Kansas +2 won 77-75 and Kentucky Under 154 covered easy 69-48. In the NBA we also had 2 one unit plays and went 1-1. Toronto +6 won 117-121 while Brooklyn just missed losing 118-125. Brooklyn was the game I sent out early in the day and as it turns out it would of been better to wait as the line went to +7 before game time. Finally in the NHL we had Buffalo +180 and they lost 1-4. So a +.90 unit day for the plays. Today so far I have sent out no plays and none are pending. I have received a few emails in the past that ask what my morning routine is for handicapping sports. I have a bit of time now so let me go through briefly what I do each morning. As most of you know not only do I handicap games but I also trade stocks actively from 6:30 AM until 1:00 PM. The ideal time for me to get started in the morning is 4:00 A. M. That gives me several hours before the market opens to not only prepare for the market open but also to spreadsheet today’s games. Once I get the games all spreadsheet with the various presets on my excel sheet. I then input the lines and % numbers into the spreadsheets to get ready for my handicapping. I then update my models with the previous days games and run my routines to come up with various projections on each game. I transfer these to excel. Than I go through the games to see if any of the variables I rely on are in play on the game. That is my initial handicapping routine. The first pass so to speak on the games. Depending on the number of games for the day it takes anywhere from 1 to 3 hours on the first pass. I will comment on what I do next in a later post. For those of you thinking about joining us now is a great time as we are covering 5 sports right now. NBA, NFL , NHL, College Hoops, College Football. This is the time of the year where I cover the most sports at one time. Instead of paying a large lump sum for each sport as most sites charge , the subscription to this site is nominal. $49.00 a month that includes my plays on every sport I cover during your subscription period. I feel its one of the best values you will find if your inclined to join a group of sports bettors to receive plays. In addition not only is the subscription nominal I have been putting out winning months and years for over ten years now. Very few handicappers can say that. Many go out of business and come back with a different name along with many other tricks. Myself I have not changed a thing for over ten years except to improve upon my techniques. I post daily and send out all plays via my private twitter feed. In addition as a subscriber your entitled to the backup SMS that I also use to send out plays. 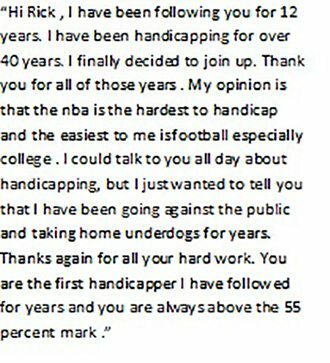 It does not end there as I also am available to answer questions and help work out your bet sizing routine with you via email. In addition all subscription options you see under the paypal drop down have a 3 day free trial.